The Dog Federation of New York (DFNY) celebrates news of a final settlement in the lawsuit brought by three New Rochelle dog owners against the City of New Rochelle. The lawsuit centered on whether the City of New Rochelle could require law-abiding dog owners to buy costly special licenses simply to walk a leashed dog in a public park. Long an advocate of reasonable access to public spaces for responsible dog owners, DFNY appeared as amicus curiae in the suit, captioned During et. al v. The City of New Rochelle. The New Rochelle ordinance required the purchase an expensive special license to walk dogs, leashed or unleashed, in the open public parkland of Ward Acres. Following commencement of the suit, the City of New Rochelle dropped the special licensing requirement and also agreed to substantially reduce fees charged for use of a three acre fenced-in dog park located within Ward Acres. Ward Acres is the only park open to dog walkers in the City of New Rochelle. The case was originally filed on April 16, 2007, as Dennis C. During, Michael S. Friscia and Marci Malone v. The City of New Rochelle in New York Supreme Court, Westchester County, Hon. W. D. Donovan presiding, Index No. 6561/07. The law firm of Paul, Weiss, Rifkind, Wharton & Garrison LLP in New York City represented the Dog Federation of New York as amicus curiae on a pro bono basis. To learn more about Ward Acres, the Westchester dog-owning community, visit We Love Ward Acres. August 21, 2008 – New York, NY: The Dog Federation of New York (DFNY) today issued a statement expressing deepest condolences to the family of Mr. Henry Piotrowski upon news of his death following a dog attack on Staten Island earlier this summer. Ms. Goer continued, “It is critical that we educate our entire community, especially our children and the elderly, about safety around dogs and the importance of responsible, humane restraint and containment.” Mr. Piotrowski was 90 years old when he died. DFNY offers its resources, free of charge, to the family, the public, and city leaders. To help educate the public about dog bite prevention, the Dog Federation of New York reaches out to local community leaders with preventative safety and educational programs centered on material published by the Centers for Disease Control and the American Veterinary Medicine Association. According to the Centers for Disease Control (CDC), almost all dog bites are preventable and fatalities are exceedingly rare. Neither the breed of dog, nor the method of restraint, are reliable indicators of the likelihood of dog bites. The Centers for Disease Control warns that dog bite-related fatalities are very unusual occurrences and that such tragedies should not be used to formulate public safety policies. “It is our goal to educate every New Yorker about dog bite prevention and keeping our communities safe,” said Ms. Goer. To help get the message to the community, DFNY offers free Public Service Announcements (PSA’s) on dog bite prevention from the Campaign for Responsible Ownership. The PSA’s are based on research and recommendations from both the Centers for Disease Control and the American Veterinary Medical Association. New York, NY – July 10, 2008 - The Dog Federation of New York (DFNY) is calling on dog owners throughout New York State to reject New York City Councilman Peter Vallone Jr.’s plans to work with animal rights extremists at PETA to ban certain breeds of dogs and enact anti-tethering laws which ban the humane restraint of dogs and endanger the community. According to the New York Sun, Peter Vallone, Jr. is welcoming support by PETA to help push his plan foward. PETA, an animal rights extremist organization, is known for calling mothers who give their children milk or meat “abusive” or “murderers”, equating pet ownership to slavery, and providing support to domestic terrorists Rodney Coronado and ALF, the Animal Liberation Front. In addition, PETA angered many of the state's animal welfare advocates by calling for the euthanasia of all “pitbulls” in shelters. According to the Virginia Department of Agriculture and Consumer Services, PETA killed over 97% of animals in their care in 2006. . "We are deeply concerned about Councilman Vallone's motives and his grasp of the facts. His association with PETA is troubling," stated DFNY spokesperson Mahlon Goer. Earlier this month, a dog attack on Staten Island involved unrestrained, loose dogs which were reportedly allowed to roam free on numerous occasions despite repeated complaints to authorities from the community. The DFNY immediately called for a full investigation as to why police and animal control failed to respond to numerous calls made by concerned neighbors about loose and roaming dogs. Following this incident, Vallone announced his plan to ask the New York State Legislature to overturn the long-standing New York State law that protects dogs from breed discrimination, and to restrict the ability of caring dog owners to safely and humanely restrain their pets. Ms. Goer further stated, “It is imperative that we protect our children and communities with laws based on facts, not fear. Councilman Vallone consistently has used misinformation as a calculated means to heighten public fears and misunderstanding, along with employing provocative language and negative stereotypes." “Anti-tethering laws also unfairly target the poor, and may disproportionately affect African-American and Hispanic dog owners living in urban or rural areas. We are worried about his agenda,” said Goer. “Race may be a factor”. Councilman Vallone’s proposal to discriminate against good dogs and caring dog owners with a breed ban and anti-tethering law was thoroughly rejected by New York’s concerned pet owners and animal groups last year. Despite claims floating on the Internet that tethering dogs increases aggression, the claims have no basis in fact. Goer cited the expert testimony of Dr. Katherine Houpt of Cornell University’s College of Veterinary Medicine Department of Biomedical Sciences, the country’s leading expert on the issue of tethering. Dr. Houpt, who has studied the issue for years, found that tethering does not increase aggression in dogs. Furthermore, neither the U. S. government's Centers for Disease Control (CDC), nor the American Veterinary Medicine Association (AVMA) condones anti-tethering laws. Spokespeople for both organizations indicate that there is no scientific evidence to support such efforts. Goer continued, "Both of Councilman Vallone’s proposals are based on bad information. Since he couldn’t ban breeds, now he wants a tethering law. Vallone’s lack of concern for good dogs and good owners, and his obvious profiling tactics, reflect poorly on him. They are an embarrassment for the New York City Council, and all New York dog lovers." “We want to make sure that New York remains the most dog-friendly place in the world”, said Ms. Goer. “Discrimination, whether against dogs or their owners, is just not acceptable”. July 2, 2008 – New York, NY -- In response to news of a dog attack resulting in serious injuries in Staten Island, New York, members of the Dog Federation of New York (DFNY) today issued a statement of sympathy and support for Henry Piotrowski and his family. Mr. Piotrowski was gravely injured by two dogs that entered his yard. Press reports indicate that residents had complained repeatedly about the dogs, which have since been euthanized. According to the Centers for Disease Control, almost all dog bites are preventable. Neither the breed of dog, nor the method of restraint are reliable indicators of the likelihood of dog bites. “We want to make sure we educate the entire community to prevent future tragedies such as this,” said Ms. Goer. DFNY is offering its resources and assistance to the family, the public, and community leaders. To help educate the public about dog bite prevention, the Dog Federation of New York is reaching out to local community leaders with preventative safety and educational programs centered on material published by the Centers for Disease Control. To help get the message to the community, DFNY will partner with local radio stations in the metro New York area to run dog safety public service announcements from the Campaign For Responsible Ownership. They are based on research and recommendations from both the Centers for Disease Control and the American Veterinary Medical Association. The Dog Federation of New York is a coalition of individual dog owners and dog-related organizations committed to responsible ownership. Our membership spans the State of New York and includes dog and pet related clubs, organizations and individuals. We share a commitment to strong and humane animal welfare laws. We write to emphatically oppose A 11509 and S 8546, bills regarding "pet dealers" which dramatically change the definition and regulation of dog (and cat) breeders in New York. If enacted, we believe that the regulations, restrictions and requirements placed on dog breeders will shut down all but the very largest commercial facilities, thereby depriving New Yorkers of access to locally bred, locally raised dogs and puppies. In addition to depriving thousands of New Yorkers of their hobbies, the proposal would make us all dependent on dogs and puppies imported from great distances when we look for pets and working companions. Clearly, this is not a step in right direction – not for pets, not for the people who love them. We urge our elected representatives to oppose A11509 and S8546. They will work to the detriment of animal welfare in New York State. The Dog Federation of New York is committed to helping New York ‘s elected officials respond appropriately to the concerns we all share: protecting the health and safety of the citizens of New York, promoting strong and humane animal welfare laws, and helping New York remain a dog-friendly, dog-safe place to live. We would be pleased to work with you to accomplish these goals. DFNY Responsible Dog Owner classes in Islip and Huntington! You’ve Got a New Puppy. Now What? Islip, NY - After partnering on a successful program of responsible dog owner classes, Islip Town Supervisor Phil Nolan and the Dog Federation of New York have unleashed the final installment of the 2008 schedule for their Responsible Dog Owner Class. “This class has been a major success - the May classes were full even before we announced the dates,” said Supervisor Nolan. “I encourage other municipalities to offer classes like this, which benefit our residents, our pet population and everyone who comes in contact with a dog whose owner has taken the course.” The FREE, two-hour class features commentary and training tips by professional trainers, veterinarians and other dog-related professionals. The class educates both first-time and veteran dog owners with a fun learning opportunity. As thanks for coming, participants will receive free goodie bags loaded with treats and toys for dogs. However, please note this class is for people only. Parents are encouraged to bring children over the age of ten. Interested dog owners should call this Town number at (631) 224-5640 to reserve a spot in an upcoming class. The Town of Huntington partners with the Dog Federation of New York to offer responsible dog ownership classes. This is the second town to join this successful program. The first class will be held on Tuesday, June 17th at 6 PM. For more information you may contact Nancy Hassel at Nancy1272@yahoo.com. 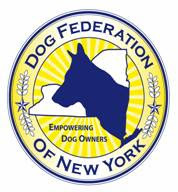 Dog Federation Of New York supports challenge to unlawful, discriminatory public policies targeting law-abiding dog owners. New York, NY – February 20, 2008 - The Dog Federation of New York (DFNY) made a motion to appear as amicus curiae (“friend-of-the-court”) on February 15, 2008 in the case of During et. al v. The City of New Rochelle, New York,. The papers delivered to the New York Supreme Court Appellate Division, Second Department, support a suit previously brought by dog owners Dennis C. During, Michael S. Friscia and Marci Malone against the City of New Rochelle and now under appeal. The dog owners seek nullification of New Rochelle’s illegal, unfair and punitive local ordinance requiring them to obtain extra photo identifications and permits, and pay special additional fees, simply to walk a dog in a public park. Dog walkers with leashed dogs in Ward Acres Park in New Rochelle are subject to a disturbing stop-and-search policy in which police officers are instructed to stop people walking their dogs and demand to see a special “Ward Acres Dog Permit” photo identification. Persons unable to produce the special permits are asked to leave the park and, under the terms of the Ordinance, they are potentially subject to fines and/or imprisonment. The law suit, brought by New Rochelle resident and non-residents and supported by the Dog Federation of New York, points out numerous violations of state law in the ordinance. New York State’s Constitution and laws protect all of its citizens from discrimination, including dog owners. Paul, Weiss, Rifkind, Wharton & Garrison LLP in New York City represents the Dog Federation of New York in this matter. The case was originally filed on April 16, 2007, Dennis C. During, Michael S. Friscia and Marci Malone v. The City of New Rochelle, New York in NY State Supreme Court, Westchester Co., Hon. W. D. Donovan, Index No. 6561/07. For further background on Ward Acres, please visit We Love Ward Acres.